In June 2005, on the heels of the resounding no given by France and the Netherlands to a proposed European constitution, a panel of seventeen distinguished experts including not only academics but also officials of the European Commission, the European Parliament, the European Court of Justice, the European Trade Union Confederation, and the European Committee of Social Rights of the Council of Europe met to reopen discussion of freedom of services in the context of the new social Europe that is clearly now called for. the self-employed coming from low wage countries. As the definitive text representing this groundbreaking forum (European Forum organised by the Society for International and Social Cooperation, Brussels, 16-17 June 2005), this book offers students, lawyers, policymakers, and other professionals a richly detailed survey of where the European project now stands. It pushes us to look anew at at the balance between fair market competition on the one hand and adequate social protection of workers on the other. The book also reprints the text of Directive 96/71/EC, along with a Commission Communication on its implementation, as well as a Euro-CIETT position paper and a Commission Proposal of 13 January 2004 for a new directive on the internal market. Notes on Contributors. Foreword. Part I. The Services Directive. 1. The Proposal of the European Commission for a Directive on Services in the Internal Market: An Overview of its Main Features and Critical Reflections; W. Gekiere. 2. The Proposed Directive on Services and Labour Law; N. Bruun. 3. Mutual Recognition and Country of Origin in the Case-law of the European Court of Justice; R. Graham. 4. The Country of Origin Principle and Labour Law in the Framework of the European Social Model; A. C. Neal. 5. The Implementation of the Proposed Directive in Services in the Internal Market: A French Perspective; J. Rojot. 6. The Implications of the Services Directive on Labour Law: A German Perspective; M. Weiss. 7. Problems of Surveillance and Control of Labour Standards; A. M. Swiatkowski. 8. Monitoring of Labour Standards in Case of Posting: Some Troublesome Issues under the Proposed Services Directive; F. Hendrickx. 9. Surveillance and Control of Labour Standards at EU Level; M. Colucci. 10. The Point of View of the Federation of Belgian Enterprises on the Services Directive; A. De Koster. 11. The Point of View of the ETUC; C. Passchier. 12. Euro-CIETT Position Paper on Required Amendments to the Directive on Services in the Internal Market; CIETT. 13. The Services Directive Needs to Be Socially Adjusted: A Political View from the European Union; A. Van Lancker. Part II. Applicable Law. 14. The Rome Convention on the Law Applicable to Contractual Obligations and Labour Law (1980); W. van Eeckhoutte. 15. Towards a More Effective Posting Directive; M. Houwerzijl. 16. 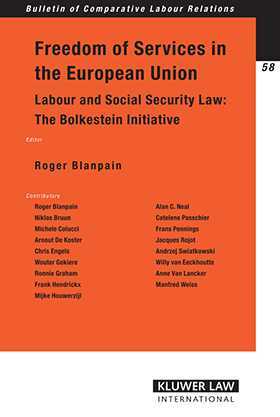 Implementation of the Posting Directive 96/71 in Belgium; R. Blanpain. 17. Implementation of Directive 96/71 on Posting of Workers in Italy; M. Colucci. 18. Implementation of the Posting Directive in the Netherlands; M. Houwerzijl. 19. Implementation of the Posting Directive in Poland; A. M. Swiatkowski. 20. Posting and Social Security Coordination; F. Pennings. 21. The Principles of the Freedom of Movement and Equal Treatment in the Context of the Discussion on the Draft Services Directive; C. Engels. 22. Directive 96/71/EC of the European Parliament and of the Council of 16 December 1996 Concerning the Posting of Workers in the Framework of the Provision of Services; Commission of the European Communities. 23. Communication from the Commission to the Council, the European Parliament, the Economic and Social Committee and the Committee of the Regions The Implementation of Directive 96/71/EC in the Member States; Commission of the European Communities. Annex: Proposal for a Directive of the European Parliament and of the Council on Services in the Internal Market, 13 January 2004; Commission of the European Communities.